Jessica Bellamy is on a mission to make data more relatable. When Smoketown, Louisville, Kentucky’s oldest historically black neighborhood, started gentrifying, infographic designer Jessica Bellamy set out to help educate people about how it was impacting the community. With roots in Louisville, the matter hit close to home. Bellamy knew that data—graphs and charts, etc.—often fails to bridge the gap between the people impacted and the raw numbers that measure those changes. She had a potential solution, though. She started using answers from door-to-door surveys of people in the area to make beautiful and compelling infographics that wove in the narratives of the people actually affected by the changing neighborhood. 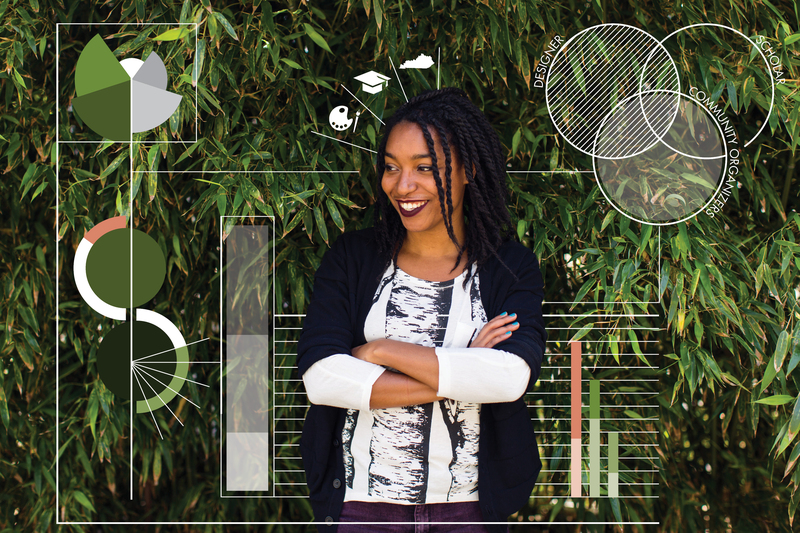 Bellamy, an infographic designer, Adobe Creative Resident and design justice advocate, uses bright, colorful design to illustrate (literally and figuratively) how “data points represent real people,” she says. Her career began after studying a variety of topics at the University of Louisville (she majored in graphic design, Pan-African studies and drawing with a minor in communication). She wanted to find ways to use design to change the narrative around people of color, especially the way black people are represented in media. Bellamy has since gone on to create GRIDS, the Grassroots Information Design Studio. She’s now part of the Adobe Creative Residency, one of only 6 creatives chosen from around the world each year and equipped with whatever resources they need to complete a project of their choosing. Her project is twofold: one part is conducting Graphic Ally Hackathons—events that pair nonprofits with creatives to teach people the fundamentals of responsibly designing infographics. During the Hackathons, creatives make graphics for a cause, and then the nonprofit critiques the designs to ensure the data accurately represents the issues at hand. The other half of her project is exploring motion graphics. She’s created a character called Bubble who morphs into infographics as a way to explain data in more dynamic, fluid ways. If you’ve never heard the term responsible design, Bellamy says it’s at least in part about including the people that the data represents in the design process. “When you’re making your work you’re being inclusive and considerate of lots of different perspectives, you’re constantly in recursive feedback cycles with people that are most affected by whatever issue it is your championing, because you know, those folks are going to know root causes and realistic solutions,” she says. Designing graphics that have impact is a process that requires a lot of patience, failure and the ability to try again. Bellamy starts her design process by reading the news on whatever topic she’s currently working on. “As I get through the more objective news media sources and start to see more of the emotionally embodied responses, I start to highlight specific data points,” she says. Read more about Bellamy and her work here.